A playful look at managing tempers for tigers of every age. Little Tiger has a temper! He stomps his paws, cries, and growls when he doesn't want to do something. 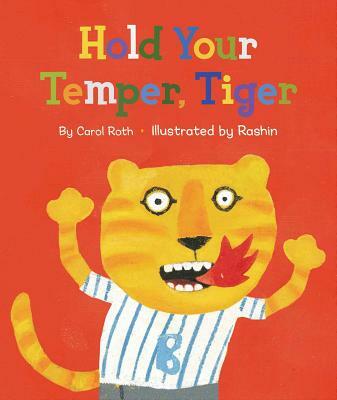 But when his mom says “Hold your temper or else,” Little Tiger has to make some changes. Where will he hold his temper? In his pocket . . . in his underwear? Carol Roth has always loved writing. Carol’s many wonderful books include Five Little Ducklings Go to Bed, Where’s My Mommy?, The Little School Bus, Who Will Tuck Me in Tonight?, and Ten Dirty Pigs/Ten Clean Pigs: An Upside-Down Turn-Around, Bath Time Counting Book. Her books have won a Children’s Choice Book Award (2005), the Missouri Building Block Award for Best Picture Book (2003), and the Parent’s Guide to Children’s Media Award for Outstanding Achievement in Children’s Books (1999). Carol lives in New Jersey (USA) with her husband, Mark. Rashin was born in Iran and now lives in Washington, D.C. She is one of the most outstanding young Iranian illustrators working today. She is a 2017 Sendak Fellowship recipient and a 2014 IBBY Honor. She has also been awarded the Golden Apple of Bratislava and was selected for the 2013 Bologna Book Fair Illustrators Exhibit. Among her many books are Two Parrots, There Was an Old Lady Who Swallowed a Fly, and The Seven Voyages of Sinbad the Sailor—her first books published in the United States. Painted in forceful shades of red, blue, yellow, and green, Rashin’s artwork makes a big impact; readers will easily recognize parts of themselves in this cranky, golden-furred hero. Little Tiger’s solution (stuffing his temper under his baseball cap) is mostly played for laughs, but the idea of decentering angry emotions could still prove useful for the tantrum prone. ...Roth uses the cap to suggest that it’s OK for Little Tiger to express himself privately without completely losing his temper. Rashin’s bold red background conveys the overall mood of the story, and the quirky pictures of Little Tiger exhaling blue, green, and red flames (some with ghoulish expressions) add a comical element to a tale about the frustrating difficulties of handling emotions.